Now summer is here and the heatwaves flow in and the week, time for a bit classy sun soaking soul. Earth Wind & Fire's Sun Goddess is a pure classic featuring Ramsey Lewis. 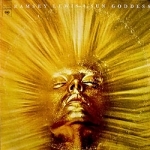 Sun Goddess was a single for jazz musician Ramsey Lewis, written by Jon Lind and Maurice White of Earth, Wind & Fire. Released from Lewis's studio album Sun Goddess in 1974. Sit back and feel the heat.